Sunday, October 1, 2017, Stephen Paddock carried out the deadliest mass shooting in U.S. history. We extend our deepest sympathies to the victims and their families of this unbelievable tragedy. The shooter had been in his hotel room at the Mandalay Bay Resort and Casino on the Las Vegas Strip days before he carried out the shooting. Mandalay Bay Resort and Casino is owned by MGM Resorts. Paddock had stockpiled an arsenal of weapons in his suite on the 32nd floor. Just before the shooting, Paddock broke two windows and fired hundreds of rounds into the crowd of 22,000 attending the Route 91 Harvest Festival, which was being held across the street at Las Vegas Village. Las Vegas Village is also owned by MGM Resorts. The concert promoter was Live Nation. Mandalay Bay and Live Nation may be liable for civil damages to the victims and families for the lack of warning signs and security deficits. News reports continue to reveal more details about what failures in security procedures occurred. Deanna Ting, hospitality editor at the travel-industry intelligence company Skift reportedly said: “What happened on Sunday is sort of a larger wake-up call for the industry to take a step back and ask themselves: ‘What about my city? What am I doing to make sure that … my guests are safe and secure?'”. The killer, Stephen Paddock, had stockpiled weapons in his hotel room for three days before firing from the windows of his suite on the 32nd floor into the crowd of 22,000 people across the street, killing 58 people and wounding almost 500 others. 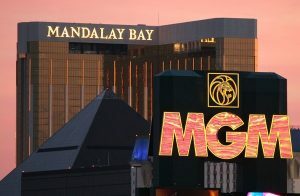 The Mandalay Bay Resort & Casino, as well as other properties owned by MGM Resorts — including the Bellagio, Monte Carlo, and the MGM Grand — have increased security levels, according to a spokesperson from the company. The Wynn Resort in Las Vegas added new security measures after the shooting, scanning guests with metal detectors and putting bags through X-ray machines. Damages which could be recovered by victims and families include damages for personal injuries and disabilities, medical expenses, wrongful death, and counseling for post-traumatic stress disorder. If you or a loved one has suffered injuries due to any negligent act or omission of another, call Collins Law Firm for a free confidential consultation at 910-793-9000.